You’re probably familiar with all the other components: heating, cooling and even humidification and de-humidification. But what is ventilation all about and how does it contribute to HVAC comfort? It’s about adding the proper amount of fresh air from outside to the indoor air in your space. In fact, ASHRAE’s definition goes on to explain that ventilation is one of the most important jobs of an HVAC system. Why? Because without it, in the best case your space lacks fresh air and becomes stagnant and uncomfortable. In the worst case, you can be trapping in toxins and contaminants that can make people sick. It’s so important that ASHRAE publishes a detailed standard for ventilation requirements for acceptable indoor air quality. If you live or work in an older building, it’s likely that outdoor air is seeping inside through leaky ducts, poorly insulated walls, and poorly sealed windows and doors. In a way this is a good thing, because you are probably getting sufficient ventilation to ensure HVAC comfort. However, it comes with a price: lost energy efficiency. When outdoor air can easily travel in, it makes your air conditioner work harder in summer and your heating system work harder in the winter, which drives up your energy bills. And of course, it also works the other way around: all your expensive conditioned indoor air that’s at just the right temperature is also leaking out. What is ventilation provided mechanically? This may be an unfamiliar term: what is ventilation that’s provided mechanically? It simply means using equipment to control when, where and how much outside air is added to your space. Mechanical ventilation uses ducts and fans to draw in and distribute fresh air throughout your space, and sometimes to exhaust air from specific areas such as kitchens and bathrooms. Mechanical ventilation is beneficial not only for energy efficiency, but to provide more control over the amount of outdoor air added, as well as its source. As we mentioned, when too much outside air is coming in, that can impede the functioning of your HVAC system (and your HVAC comfort) and drive up your energy bills. It can also create an air balance problem in your space if more air is coming in than going out. Do you have door opening by themselves, or odors migrating where you don’t want them, like from a restroom to where customers can notice? Or from a restaurant kitchen to the dining room? That’s a sign of an air balance problem caused by poorly designed ventilation. Not enough fresh air coming in makes your space stuffy and traps in undesirable air and everything that’s lurking in it, including odors, moisture and even contaminants. The EPA recommends the use of mechanical ventilation to prevent the buildup of odors, excess moisture and pollutants in your space. Odors are annoying and in a business situation can cost you money. Moisture can lead to worse problems: mold growth and also damage to furnishings, equipment and finishes. Mechanical ventilation provides the ability to expel odors and moisture from areas. This is important for residential kitchens and bathrooms, but essential for commercial spaces such as restaurant kitchens, gyms and locker rooms, and restrooms. Obviously expelling pollutants, especially VOCs that you might not even be able to smell or detect, is an important step to safeguard the health of everyone breathing the air in your space. Mechanical ventilation systems also provide the ability to control where outside air comes from, as well as where indoor air is exhausted from the building. Why is this important for HVAC comfort? Let’s look at a couple of examples. If your home or business happens to be located next to a restaurant, or a gas station, or an industrial facility, you want to avoid odors from your neighbor migrating into your space. The right mechanical ventilation system can be designed to locate intakes on the other side of your building, and as far away as possible from sources of odors and pollutants. Exhaust locations are just as important. You don’t want moisture-laden air exhausted into an area where it can cause damage. Or odors and pollutants expelled where family members or customers will be breathing them in. There are various types of mechanical ventilation systems; some are connected to your HVAC system, while others are separate. The type that will work best for your HVAC comfort depends on your space, its usage and even on your climate. Certain types of mechanical ventilation are designed for hot and humid climates, others for cold climates, and others for mixed climates such as we experience here in the New York City area. Choosing the wrong system can cause a buildup of moisture that can damage your space and even lead to mold growth. That’s why it’s so important to choose an HVAC company that understands the “V” in HVAC as well as heating and air conditioning. 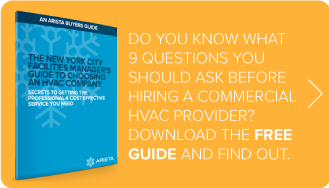 The NYC Facilities Manager’s Guide to Choosing an HVAC Company. Read the next topic in our series on things techs wish people knew about HVAC: Top 11 Ways to Get Better HVAC Energy Efficiency.